Do Your Translations Look Like This? Do your translations look like this? If so, you’ve got problems! This is the actual result of a translation by a software solution we will not name here – but you can imagine how dismayed the user was when they saw this output! The user contacted us and we set them up with a copy of TransMagic to solve their problem right away. Mis-translations can take many forms, from missing geometry (usually the most complex, organic geometry is missing, and prismatic geometry is retained), to missing details and PMI, to geometry that is there, however unusable; the screenshot above is simply the most outlandish and entertaining case of unusable geometry we’ve ever seen. TransMagic is built on 15 years of translation excellence, and we’re constantly working to improve translation results. Recently, we found out that one type of JT translator on the market creates badly flawed JT files, which were adversely affecting some of our customers; to remedy this, we’ve implemented a predictive heuristic that will detect incorrect or exploded transforms in JT models and proactively correct these errors upon reading them into TransMagic. That’s one example among thousands that go into making TransMagic what it is today. 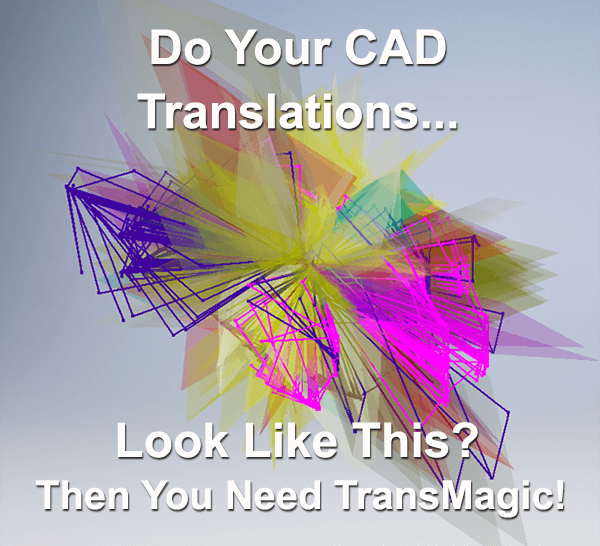 If you’re having translation problems, you owe it to yourself to try TransMagic; TransMagic is purpose-built for quality translations from CAD to CAD and CAD to Poly. Learn more about TransMagic’s quality translations here.